Clean, green, and made to be seen. 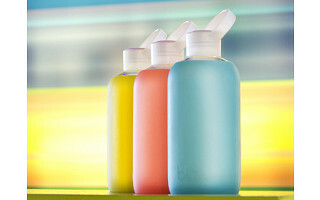 It’s bkr (pronounced “beaker”), a water bottle that’s as fashionable as it is functional. 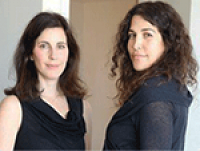 Tal Soltz and Kate Cutler are the creators of bkr. The two friends were inspired to kick the disposable water-bottle habit and create a reusable H2O carrier with a chic aesthetic. Tal and Kate chose glass to get the best tasting water (no metallic flavor) and to avoid the potential to leach chemicals. To protect the glass, they wrapped it in a soft silicone sleeve. The style of bkr is minimalist but not timid. The clean lines and vivid sleeves are a reflection of the founders’ love of modern art, international design, high fashion, and eco living. There are no garish graphics or chunky accessories. The silicone sleeve makes it easy to grip, and the streamlined handle is a perfect fit for two fingers. The cap, made of recyclable polypropylene, fits over a modest-sized opening that’s comfortable to drink from without dribbling. All the elements come together to create a water bottle you won’t want to stash in a backpack or hide in a locker. At the gym or in a conference room, bkr is a stylish union of form and function. Any plans to make larger bottles? I try to drink 100 a day and I fill them first thing in the morning so they are always ready at my desk. @ Bonnie While we love the easy to carry size of our 500ml bkr, we are exploring a larger size...stay tuned! Just ordered mine! Beautiful design and functional. I love the look of these bottles and I really love the idea of a glass bottle. What are the chances you will ever have these made in US? I would be willing to pay a higher price for product made in country. Thank you. @ Alesia We would love to one day manufacture in the US but at this time to do so would be prohibitively expensive. Therefore, while we continue to do all design work in the US we have found amazing manufacturing partners abroad. @Alesia I understand that these are made in San Francisco. oops, I guess just designed there. New Year is to try and buy "America" we need the jobs! Agree to Made in USA comments. I have been trying to refrain as much as I can from any outside manufacturing. American made is the best. We love that our Grommet community is so passionate about made in the U.S. products. For that reason, we have an entire section of our site dedicated to these products. You can view this page here. In the meantime, when you come across a great made in the USA product, suggest it as a Grommet by clicking on the link in the header or footer of any page. The weight isn't heavy. They are less than 1 lb each. @ Anita an empty bkr weights 0.9lbs - it is the perfect size to tote around with you. Love the concept! Am wondering how sturdy the silicone makes these. Bumps and drops happen, have you tested these for falls from differing heights? $28 is a lot if one drop crushes the glass. Thanks for your question. One of our employees tested the product by dropping it from about 5 ft and it survived just fine. Therefore we think it should survive the day to day usage and any bumps you encounter along the way. @ Melissa bkr bottle is made of glass - it's durable glass protected by a cushiony silicone sleeve, but it is still glass - so treat it carefully as you would your cell phone or any other thing you love. If you accidentally break it in the first 90 days, we will replace it for you. I really like this idea. Wish they were made in the USA. I would love to have one. We know that many of our community members like products made in the U.S.A. While our partners always try their hardest to manufacture here in the U.S., sometimes it's just not possible. Because we feel so strongly about this issue as well, we have an entire section dedicated to it. Feel free to browse the section of our site dedicated to these products. You can view this page here. Clean, green, and made to be seen. 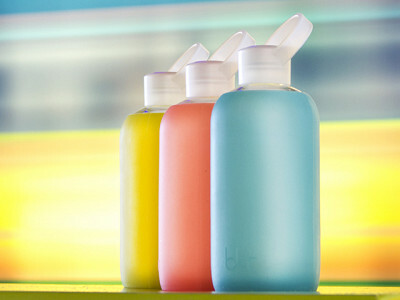 It’s bkr (pronounced “beaker”), a water bottle that’s as fashionable as it is functional. Tal Soltz and Kate Cutler are the creators of bkr. The two friends were inspired to kick the disposable water-bottle habit and create a reusable H2O carrier with a chic aesthetic. Tal and Kate chose glass to get the best tasting water (no metallic flavor) and to avoid the potential to leach chemicals. To protect the glass, they wrapped it in a soft silicone sleeve. The style of bkr is minimalist but not timid. The clean lines and vivid sleeves are a reflection of the founders’ love of modern art, international design, high fashion, and eco living. There are no garish graphics or chunky accessories. The silicone sleeve makes it easy to grip, and the streamlined handle is a perfect fit for two fingers. The cap, made of recyclable polypropylene, fits over a modest-sized opening that’s comfortable to drink from without dribbling.